flyer Fall 2018-19 CLASS SIZE ARE LIMITED to enhance 1 on 1 interaction with students. CLASSES FILL UP FAST. 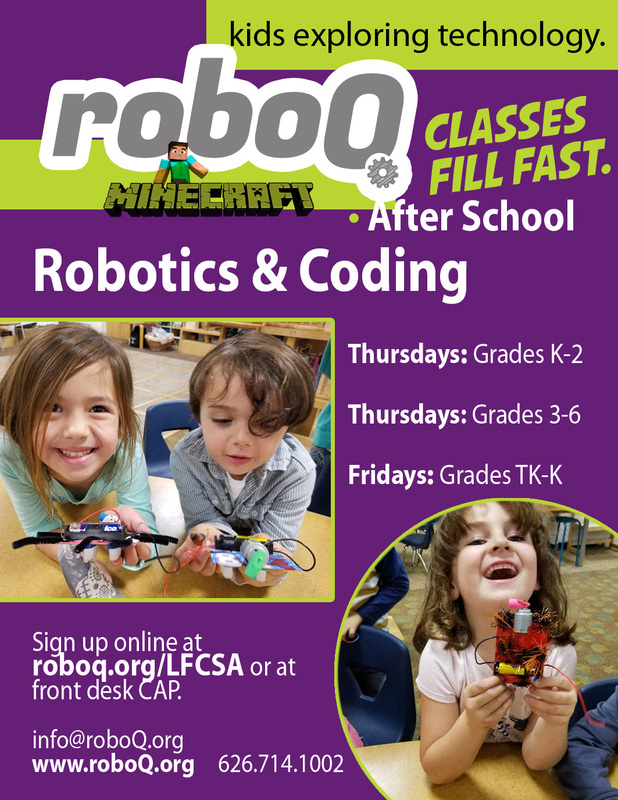 Thursday: Robotics and Tinkering (Grades K-2) Thursday: Minecraft Coding (Grades 3-6) LIMITED SPACE. We are pleased to announce an exciting mixed age group project: Chain Reaction with Electronics. Please contact CAP and info@roboq.org for further details. We will allow children that are comfortable with tools to use hot glue and drills. We will also work on several projects and provide ample time for more creativity and exploration. Please make sure you login or create an account by clicking ‘My Account’ above before registering your child for the class. Select the Grade level and then click on REGISTER to register for the class. You can also register at the front desk at CAP or talk to Jenina Castro.